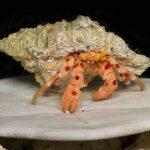 There seems to be a never-ending stream of new species being discovered in the Caribbean thanks to the efforts of the Curasub and researchers at the Smithsonian. 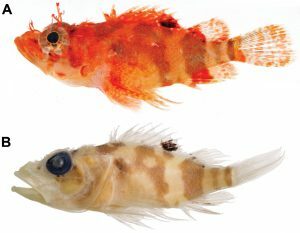 Most of what we’ve seen so far have been tiny little gobies that would have been nearly impossible to sample without the use of a manned submersible, but the latest fishy find is something quite different—a brand new brightly colored scorpionfish that only grows to a couple inches in length. 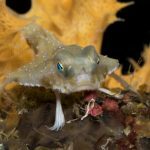 Scorpaenodes barrybrowni is a relative bantamweight compared to some of its brawnier brethren in the scorpionfish family, with a maximum known size of around 50mm. It has thus far been found at depths of 95-160 in Curaçao and Bonaire in the Southern Caribbean and to the west during a recent expedition in Dominica, and it can be readily identified from its bright yellow pectoral fins and the starburst pattern formed around the eyes, which has given rise to its common name—the Stellate Scorpionfish. There are also many other more subtle diagnostic traits in the fin ray and lateral line counts, as well as genetic differences to support the uniqueness of this species. 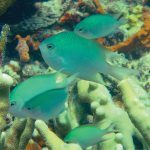 Its scientific name honors the efforts of Barry Brown, whose remarkable work documenting the deep reefs with the Curasub has led to many exciting zoological discoveries. Only two other species in this genus are known from the West Atlantic (with many more in the Indo-Pacific), but neither of these are commonly seen in aquarium exports. 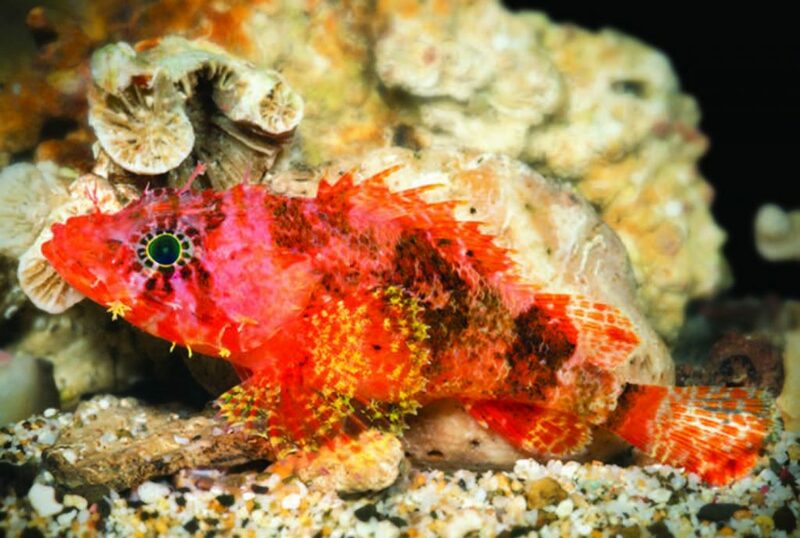 In shallower waters we find the Reef Scorpionfish (S. caribbaeus)—the only species to be somewhat regularly offered to aquarists—identified by its unique spotted patterning. Further down in the mesophotic zone occurs the Deepreef Scorpionfish (S. tredecimspinosus), which has a distinctive white caudal peduncle and relatively clear pectoral fins. 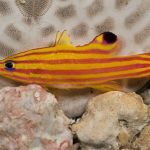 This rarely seen species has previously been brought to the surface by the Curasub, but specimens of this beautiful fish are seldom available. 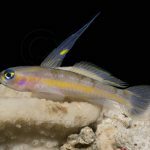 Given the small maximum size of these species, it’s a bit surprising that this genus hasn’t found more popularity in the aquarium trade. These pint-sized predators are a beautiful, hearty and coral-safe addition to an aquarium.